Over the last few days, both my blog and I have gone on a diet. Now I don’t do New Year’s Resolutions anymore, and somebody said to me ‘why go on a diet in the middle of Winter when you’d have far more success of losing some weight in the Summer?’, so I decided to go on the ‘Hugh Diet’. The ‘Hugh Diet’ is very easy to follow, and I’ve already had results. All I have done is eat smaller portions, cut out snacking, cut down on alcohol intake, and go out on at least one long walk a day. Having Toby around helps, as the pup needs walking, so I make a real effort and, weather permitting, join him and John on their afternoon walk instead of sitting at the computer. I’m taking two ten minute breaks a day and sit and close my eyes and take some time for myself to do absolutely nothing. I get bored very easily, so ten minutes is enough for me. I managed to lose two pounds in weight last week, and I’m already sleeping better and have far more energy. This got me thinking (no not the walk, the diet) and I informed my blog that it too was going on a diet. So, what is a blog diet? First of all, I gave my blog a lick of paint. I kept the same theme as I only changed it a few months ago, but I played around with the colours, tidied up my sidebar and widgets, and this has resulted in it having a bit of a new look (what you never noticed?!). It was like taking it to the hairdressers and giving it a shampoo and set. Then I got to work on looking at how many blogs I was following, and was shocked at the numbers. No wonder I had days where all I was doing was reading, trying desperately to get to the top of my WordPress reader list, which I rarely did. Something had to change, so I started to look closely at all the blogs I was following. A new blogger friend, Sherrie, over at ‘A View From My Summerhouse‘ recently mentioned in a post that a fair chunk of ‘bloggers burn out’ after two years. Next month, I will have blogged for one year, and I didn’t want to become one of the statistics Sherrie had mentioned. If anybody followed my blog, then I would follow them back, especially new bloggers – as I was once in their shoes – and I now had a list of nearly four hundred blogs I was following. It was making both my blog and I feel overinflated, and something had to be done to cut this number down. It’s a sad fact, but going through the list of blogs I was following, many seemed to have been abandoned. They were the first ones to go, so any blog which had not been posted on, or where I’d not heard from the author by way of a ‘like’ or comment for at least six months, were deleted from my list. Then there were the blogs where the author never answered questions about a post they’d written or responded to any comments left. They were the next to be removed because I couldn’t understand why anybody would write a post and not want to interact with their blogging community and followers about it. Next, I looked at blogs I followed because the author had followed me first. There were quite a few I’d been visiting for at least six months, leaving ‘likes’ and/or comments but the author never seemed to come and pay me a visit. No visits, no liking of any of my posts, no comments left. Why follow me in the first place if you are never going to come and visit? The clue was also in their ‘about me’ page where there were comments after comments saying “thanks for following my blog”, nothing else other than that. To me, this clearly showed that all the author wanted was followers, nothing else but followers. No trying to build a blogging community or helping promote other bloggers, just in it for themselves. I can only compare it to being in a busy room of people at a party and standing in front of a person who does nothing but talks about themselves, never giving you a chance to say anything or ask you any questions. You’d want to try to quickly move on to someone who wants to interact with you as much as you want to interact with them, yes? The axe promptly fell on these blogs. Now I may lose quite a few followers for reducing the number of blogs I follow, but boy, do I and my blog feel better for it. Because of the love-hate relationship I have with my WordPress reader, I’ve also started to follow many of the blogs I still follow, over on Bloglovin’. I get one email a day from Bloglovin’ with a list of bloggers who have posted the day before, with a link to their post. It’s easier to catch up with them like this than scrolling through that reading list hoping I’ll come across their post. For those not on Bloglovin’, I’ve turned on the WordPress daily ‘notify me of new post’ icon so that every time they publish, I get an email with the link to the post. I’m linking this post to “Mindful Monday” which is new feature Colleen has created over on her blog, Silver Threading. Go check it out and see what Colleen is doing to help look after her health and wellbeing. Previous Post: Why I’ve Watched The Movie, Mamma Mia!, Over Fifty Times! Good to hear, Ali. I’m glad it has been of some help. Happy culling. Eureka! I know what I’m going to be doing this weekend 🙂 Thanks for the inspiration, Hugh! Love your dog. As for blogging? She is a fickle mistress. Some great observations here and a lot of truth. Yes, he gets far more attention than I do when out walking with him (but I don’t mind that). Thanks, Paul. I got to the stage where I had to do something, and this diet seems to be exactly what I had to do to get my life back from the mistress we call ‘blogging’. Last Sunday when I sat at the computer the sweat was dripping off my face. These days it’s more perspiration then inspiration. Have you had any snow this season? Mind sending some over here if you have? Well done, Maria. The Christmas season always seems to get people to put on weight, but I’m not at all surprised what with all the goodies on offer. I’ve still got a stack load of chocolate I have not touched due to being on the ‘Hugh diet’ and I’m pleased to say I’ve now lost 6 pounds. However, unless I do more, like exercise and the likes, then I think my weight will plateau out and I won’t loose as many pounds as quickly as I have done. I’m not liking your summer weather at all, Maria. That is why I usually dislike Summer so much. I really do not like it when the temperature is over 30c and the air is humid. Give me 25C and a fresh breeze and I’m very happy. It has been cold here and, last Tuesday, we even had a small covering of snow. However, it was all gone by lunchtime and Toby was very disappointed by that. We are in for some really cold weather later in the week so, hopefully, he’ll get some more snow then. I hope the blogging cull goes well, Maria. It’s a real shame to see so many of our blogging friends from the class of April 2014, no longer blogging. Yes it is a shame to lose touch with people over time. I still have some chocolate I bought in Tasmania that I am rationing out now that I am determined to lose some weight! Let me know how you do if you decide to put your blog on my diet. It’s certainly helped me grab lots of time back. Bravo Hugh! Sometimes you gotta trim the fat and wade through the chaff so that you can reap the benefits of an interactive community of fellow bloggers. I know that at times the number of blogs you have to read can become over whelmng but I liken this to wandering about a candy store.All the treats are tempting but only a selct few should be coveted for their non addictive features. Too many bloggers feel compelled to write as much material as possible in order to not only attract a certain number of new followers but also to prove to others that they have scads of thing to say. They should try to create a mental game plan for themselves and their bolg entries so that their material represents the very best their creative talents can produce. If the world does not like their work then tough. Produce material that you as a creative and unique idividual will be happy with. Try not to limit yourself to a production line deadline which will inevitably drain you of energy, creativity and the desire to crate original material. All the best to you in the new hyear Hugh. Sometimes trimming back is an ideal way to reap more benefits than you could have otherwise possibly anticipated. You describe it so well, Gerry. Yes, there are so many wonderful blogs to choose from to follow and read, and my blog diet has helped me drop the ones that never visited me (after following me first) so now I have far more time to read the blogs of those that like to be part of a blogging community. Plus, with using Bloglovin’, I now get just the one email telling me who has posted, with a link to that/those posts. I don’t like switching on the computer and seeing an overflowing mailbox, as it makes me rush replies, wanting to get rid of those emails as quickly as possible. Yes, some bloggers do post quite a lot of posts every day but, for me, providing the quality of the posts do not suffer then I will continue to follow. If the quality suffers because of deadlines or the blogger is simply rushing posts to get as many out there as possible, then I will unfollow (I’m pretty sure in your comments that is what you were saying as well). For me, publishing two, maybe three, posts per week is the perfect medium and I’m happy with that, so I guess it’s what ever makes you happy and you feel comfortable with. We are all different. Since starting my blog diet I’ve certainly spent less time here on Planet Blog (as I like to call it). I am addicted to blogging, like most of us on here are, and it gives me such pleasure and is something I truly enjoy to do, but I’ve learnt that there is life away from the blog and I was ignoring those parts of my life too much before. 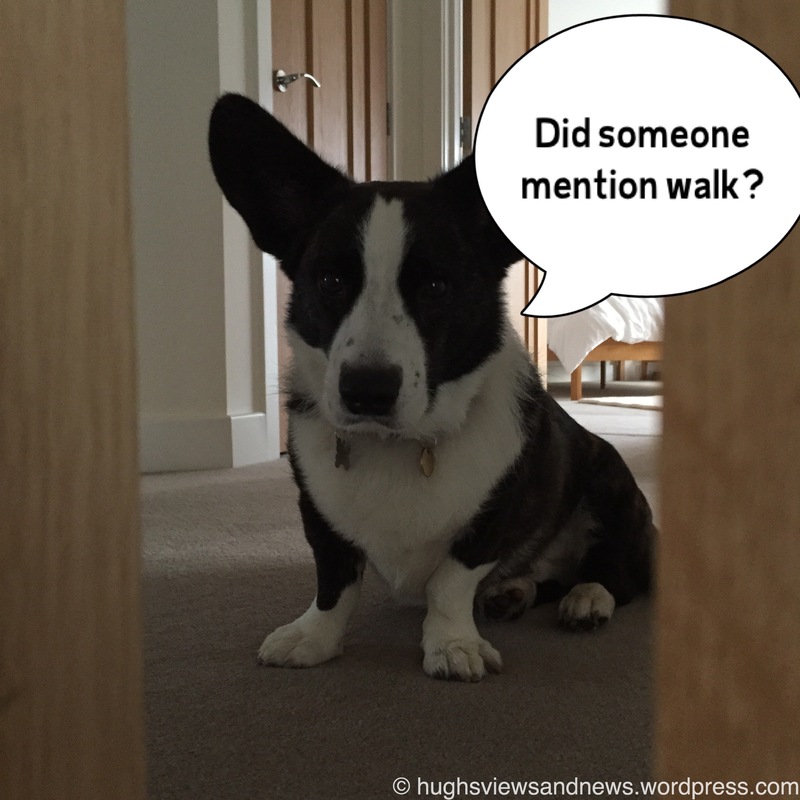 I’m only two weeks into my blog diet but it already producing great results, and Toby is certainly getting to see a lot more of me on his walks. I hope the new year has started on a great note for you, Gerry. With very best wishes and much success to you and your blog during 2015. Hi, if your blog is on a diet, mine is on starvation. Illness, broken toe, long distance family difficulty, a bit of depression; but today the sun is shinning and I’m considering what to do next. I can see by your example it’s time to tidy up the follows. Perhaps I’ll give blog lovin’ another try. I need a little shot of enthusiasm and a kick start. Oh, Meredith, I’m so sorry you are having a tough time at the moment. That broken toe sounds very painful. How did you manage doing that? I wore a boot for 4 weeks. I had to stop my exercise classes. Now I don’t want to start again ha ha. I shall though if you don’t move you’ll lose your ability to. All sounds very painful, Meredith. I wish you well and hope you are back on top of life very soon. Nope, not a good idea, Jo, and that’s why I registered my blog with Bloglovin’ and found a lot of the blogs I follow here on WordPress, over on there as well. With Bloglovin’ I get just the one email each day with a list of who has published a new post and a link to that post. It’s so much better than getting an individual email for each blog you follow from WordPress (if you have selected to receive emails). It’s also only takes minutes to register your blog. Good luck if you decide to put your blog on a diet. If you do ahead with it then please do let me know how it all went. I knew your blog felt different … but then the header was the same and I was confused! What a good idea … what a lot of good ideas, I should say! I can understand the need to check through blogs we follow to see if they are still around especially when blog post checking seems to have taken over too much time in the day. Also, I have ‘check out Bloglovin’ on my New Year’s Action List, thank you for enlightening me a little on how it works! I throughly recommend putting your blog on a diet and checking the list of blogs you follow often. You’ll be amazed at just how many are no longer active. As for Bloglovin’, it’s my new best friend and I love what it does in putting all new posts from the blogs you follow in just the one email each day. No more trying to reach the top of the WordPress reader list and feeling guilty if you miss reading a post of a blogger you always visit. The Hugh Diet is going well. Tomorrow is weighing day, so fingers crossed I’ve lost a few more lbs! I decided to do something similar with my theme – I like the theme so I just change the header with the season. I have now added ‘blog diet’ to my ‘to do’ list! You have inspired me! … and I will definitely check out Bloglovin’. I noticed that, Peggy, and I like the idea of changing colours or header photos with the season. A slight change can make all the difference. I’m so pleased you are putting your blog on a diet. It may be a little hard work but, believe me, you’ll be glad you did it and have a sense of achievement when it’s all done. Bloglovin’ is my new best friend and do let me know when you have registered your blog there so I can follow you from there instead of via the WordPress email method. I tend to just absolutely clear my mind and try my best not to think about anything during those 10 minutes, but it can be difficult to that sometimes with ideas for posts popping into my mind but at least I’m away from the computer. Ah, you said the words “WordPress Reader list” (well almost). That what was giving me the problem in trying to always reach the top of it but always failing. That’s why I made the changes and put my blog on it’s diet and, so far, so good! What is the Newsify account? Is that something over on Twitter or here on WordPress? I would recommend you check out Bloglovin’ as well, Steve, as I don’t think I could find your blog over on there. It’s so easy to set up and, once you start using it, you will wonder why you never did use it. OK, I just found you. I was missing out the ‘-‘ when typing in your blog name in the Bloglovin’ search box. I’ll check out the post about Newsify while I’m there. Hugh, I came upon your blog as a result of a comment you left for Elizabeth over at Tea and Paper. Hearing about your salad made me curious! 🙂 This was a great post. I am a newbie to blogging (about 10 months in) and have been slow to follow blogs because I start to feel overwhelmed. How do you keep up with them all? It sounds as if even with your weeding you still follow quite a few people! Ah, that salad. I’m glad it has pushed you my way. Grace. Elizabeth wanted that salad instead of the cheese sandwich she was having for lunch. I hope she managed to make one up for herself for the following day. Thank you reading and liking this post. I’m a newbie as well with just 11 months blogging behind me, but I seemed to have picked up a huge amount of blogs to follow in that time and they were really weighing me and my blog down. I wasn’t able to keep up with them all, so hence the blog diet idea, and I was amazed not only by the number of blogs I was following but just how many I unfollowed for all the reasons I outlined in my post. The blogging site Bloglovin’ also helps as it sends me an email each morning listing all the blogs I follow where a new post has been published the previous day, and a link to the post. So just the one email from them instead of individual ones like WordPress send for each blog where I have switched on the email notification. Yes, even with the cull, I still follow a lot of blogs but I now feel in far more control because of what I have done. I’m certainly not panicking anymore trying to reach the top of the WordPress reader list. I’ll only refer to it now if I find I have time to do so after catching up on the blogs I follow through Bloglovin’ and WordPress email notification. Thank you so much for stopping by, Grace. It’s always lovely when somebody comments on one of your posts for the very first time. Thank you, Grace. I’ll certainly be paying you a visit on your blog as well. Have a great weekend. Your blog diet looks like the blog section on my goals. I am working on my appearance right now and plan on moving onto the blogs I follow next. I feel your pain with Word Press Reader. I find it especially stressful when I fall behind on my reading. I recently headed over to Blog Lovin’ to revive my account there and it helped me catch up on all of my favorite blogs. Congratulations on losing those 2 lbs! That’s great! Kat, thanks for the thumbs up on the new look blog. You are the first to mention it. It’s not a huge change, but one for the better I think. It’s tough job when you come to deciding which blogs to stop following but, once you have done it, I hope it makes you feel a whole lot better and you do get to see all that spare time come flooding back. As for the weight loss, I’m carrying on with the Hugh Diet and hoping I get to lose a few more lbs. Thanks for the encouragement, Kat. I think it’s always good to tighten up the look of your blog. I know it’s going to be a tough call when it comes to stop following some blogs but I know I need to do it. You’re very welcome. It’s great to hear that I am passing on some encouragement to others and hopefully helping, if only a little. My blog diet seems to have captured much attention and most of the comments I have had about it have been positive. Keep us posted of how well you do on both your and your blog’s diet. I’d love to hear if what I am doing/have done, works for others. And I’m not surprised that your blog diet has gained attention. It’s something that everyone should consider doing. But at least you do visit other blogs even if only every few weeks because of time restraints. I’ve even heard of people camping out on a blog where they go and stay for a few days and read, like and comment on just that one blog. We all lead very busy lives and we are all have a different approach to how we like to relax. I like to relax by reading, but I now only read from a computer screen for so long before I take a break and do something else. I absolutely enjoy blogging and log on to WordPress just about every day. I get a lot of enjoyment out of it, but I have now learnt to switch it off and to go and do something else rather than spending all day here. My blog diet has certainly helped me but, as you say, everyone has their own strategy. Which is where one of the ideas for this post came from after I read a blog post that said that many bloggers and their blogs burn out (for various reasons) before two years. Thanks, Olga. I’ve not heard of Triberr or Networked blogs before. Would they not show up on Bloglovin’ as my understanding is that most blogs (what ever Platform they are on) will end up on Bloglovin’ providing the author has a Bloglovin’ account? Wow Hugh, I only follow maybe a dozen or so blogs and I have a hard time even keeping up with that. I’ve found that by searching key tag words related to topics that interest me, I can find a lot of interesting reading material without committing to a “relationship”. If the same blogs keep appearing over and over with fresh material in my searches, then that blogger just might be a good candidate to follow. As for blogging burnout, I started with one article a week about 1000-1200 words long. That got to be a bit much, and I’ve seen research that shows after 500 words or so many readers get bored and skim to the end or quit outright in the middle of the piece. I kept the one post per week commitment, but I cut my articles in half. The the results have been very encouraging. I feel way better not beating myself to death trying to keep it interesting for 1000-plus words and I don’t think the quality of my work has been diminished. I do not have nearly as many followers as other blogs that have been around as long as mine, but I attribute that to 1) I have a full time “real job” and can’t lounge around promoting my website all day, and 2) I am not very active on WordPress. About 85% of my regular readers come from outside WordPress and are not bloggers themselves, and that’s by design. I appreciate the WP community and will take all comers, but as I’ve mentioned elsewhere, at times WordPress feels like a glorified version of Facebook where everyone “likes” each other and trades pleasant comments without any sincerity. My main goal is to have a blog that everyday non-blogging people would enjoy. The tradeoff is fewer followers, but the ones I do have truly want to be there because what I say has real value to them. Anyway, I think you’re going in the right direction. Keep at it. I’ll be out here for ya! Hi Chris, I was as shocked as you were when I saw that number next the number of blogs I was following. I knew I had to take action, hence the diet idea and a follow up with this post. With regards how long the ideal post should be, I’m more down the line that if I find it interesting and am enjoying reading the post, then I’ll read the whole post. I have read some posts which were over 3,000 words and got a lot of enjoyment out of them, but then I’ve also abandoned blog posts if I consider them of no interest to me at all. I try, where I can, to keep posts to under 1,000 words, but sometimes rather than create a follow up post with just a couple of hundred words, I’ll plod on with the original. I post twice, sometimes three times, a week and concentrate more on the quality of the posts rather than the quantity of posts. That seems to have really worked well for me. I know this post was much about ‘number of followers’ but I have written some past posts where I’ve emphasised that numbers do not matter. According to my WordPress Stats I have around 400 followers, but only 15% – 20% are in regular contact with me by giving my posts either a like or leaving a comment. The number of followers my blog has no longer matters to me, whereas post likes and comments do. It would not matter if I had 10,000 followers or only 20 followers, as if my posts were not getting any likes or any comments then I would almost certainly reconsider my days here on WordPress. As always, thanks for your support, Chris. This is a very interesting post, Hugh. I too get A LOT of those ‘robot-followers’ – those blogs that now do not exist or those blog that exist for gaining a following. I’ve never really noticed blogs that have many “Thank you for following” comments on their about page. I don’t know, maybe it’s because I am very selective about who I follow. I know some blogs where I comment on and do not get a comment. That is okay with me as most of the time they’d come round to my blog and either give a like or comment, or both, no matter how short. That is very courteous. Thank you, Mabel. I don’t think I’ve written a post which has generated so many comments like this before. It seems I may have hit on something many of us on here can relate to. As I mentioned in my post, I’ve seen quite a few ‘about me’ pages on blogs where there is comment after comment saying “thank you for following me.” At first I thought ‘great, this author follows and reads a lot of blogs’ but then I started to see a pattern in these blogs, where the authors have never commented or liked any of my posts. OK, maybe they have read them and just did not like what I had written or had any comments to add, but having now published over 140 posts in 11 months, I would have thought that at least one of those posts would have generated a like or comment, otherwise why follow me in the first place? Maybe they followed me and then as soon as I followed them, they unfollowed me? I don’t know, but whatever the reason I still don’t understand why anybody would do it apart from to get their own ‘follower’ numbers up. I always answer all comments but, where I have nothing to say, I will always like the comment so that the author knows I have read his/her comment but that I have nothing further to add. Thank you for your lovely comments, Mabel. I look forward to reading your future post about commenting. I think blogging is a nervy topic, when you critique it. There really is no reason why we can’t blog for followers…well, we’re all different bloggers. Some blogs get over hundreds and hundreds of comments and Likes, I don’t know how they keep up. I quite agree with you, Mabel, that we do need followers, but followers who will interact with you are far better than those that never visit (I’ve started calling them ‘ghost followers’). I don’t follow blogs to never visit them again, I follow because I find the blog interesting and I like what is written or what I see when photographs are posted. I may not enjoy all the posts on a blog, but I always leave a ‘like’ when I really have enjoyed reading a post and add a comment if I do have anything further to add or have any questions. You are right that blogging is a nervy topic and I guess it’s because it is so very close to all our hearts. I know that time doesn’t always give everyone a chance to reply to comments, but it just takes a second to click on the ‘like’ icon next to a comment. Those that get hundreds of comments and/or likes do have their time cut out to reply to all. However I have seen blogs where the author has at least replied to some of the comments, if not all. Where none of the comments or questions are replied to, it’s almost as if everyone is being ignored. Grand Idea Hugh, but you do know that diet is simply die with t added? 🙂 I refuse to do it anymore, as it always ends up with me increasing in size. Blogging takes time, and like you I made the decision many months ago to cut a lot of blogs off, sadly, as some of their first posts were quiet interesting. However, it does make things much more manageable time wise for me. I have never looked at my stats/followers, simply because that doesn’t interest me. I blog for me, if someone else wants to like or comment that is great, because we all like to think we have something good to share, but if they do not that is fine too. Sometimes my anti-social tendencies kick in and I do not comment as much as I should, or only briefly, but I do read and like. Of course it always lovely when you find a blogging friend that has interesting things to say and likes you back, consistently. Have a lovely walk with Toby. Oh no, I never thought of the word ‘Diet’ like that, Claudette. Well the ‘Hugh Diet’ (if you can even call it a diet) allows you eat what ever you want, just in smaller quantities plus getting away from the computer more often to go and see what else life can offer. From the comments I am getting about this post, it seems that most have already cut back on the number of blogs they follow for various reasons. I probably should have done this a long time ago and kept doing it as well. Like you, I blog for me, because I absolutely enjoy it. It’s got rid of a lot of barriers in my life and I’ve made some wonderful new blogging friends in the process, and I so much enjoy reading their work as well. I’ve learnt so much about writing and am now in a world I never believed I would be in when I started my blog 11 months ago. Getting likes and comments on a post is indeed a wonderful thing but I still can not get my head around why somebody would want to follow my blog if they are never going to read any posts, like any of them or comment on any them. As I write and publish more and more on here, surly there has to be something these followers will like or comment on? Otherwise, why follow? OK some members of my family have never liked or commented on any of my posts but they’ll talk to me about a certain post when I see them or, in some cases, send me a quick email to say they enjoyed what I had written. Thank you for your thoughts about this post, Claudette. It’s always a real pleasure to hear from you. This seems like a very good blog diet plan. I started following blogs solely on comments left on my blog or on mutual blogs, that way I know they are usually engaging with others vs. follower collecting. Thank you so much. You have a very good plan there by following when comments are left on your own or mutual blog posts. However, I do like to give anybody who just follows me without leaving a comment, a chance. Maybe that is my downfall and how I got myself into the situation I described in my post. Now that the number of blogs I follow is far less than it was four days ago, I am keeping an eye on those that are maybe just follower collectors. I’ve made some wonderful blogger friends from bloggers who simply just followed me first without leaving any likes or comments, but who then came to visit me again once I started leaving likes and comments on some of their posts. The lovely thing about fruit is it does feel like you are having dessert. I never thought of fruit as a dessert before, but you are so right. It’s a lovely thought. 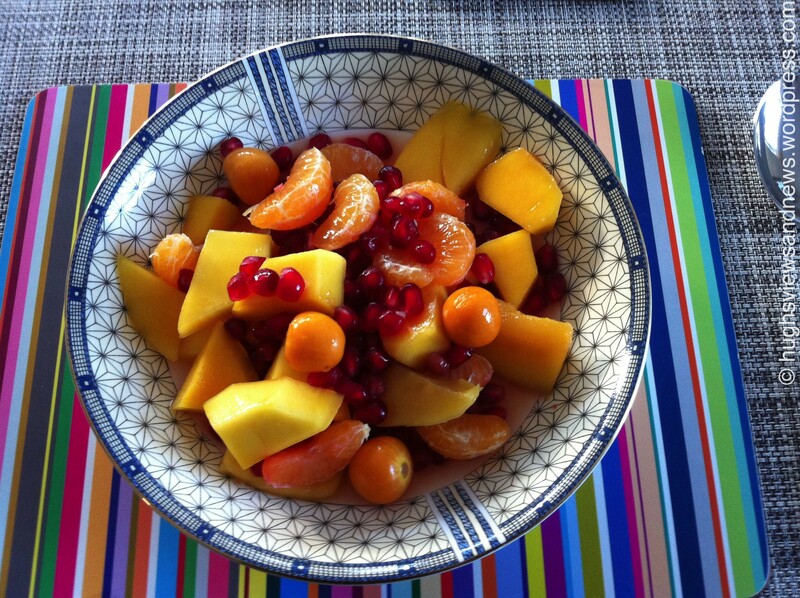 The fruit salad in my blog post was actually something I ate at breakfast time. I like cat’s as well but Toby is frightened of them. Well done Hugh for doing what I should think many of us think about doing all of the time. Dieting and blog dieting. Firstly. congratulations on your weight loss and what a lovely picture of Toby… who could resist walking that little cutie? Secondly. I think your clean up on your blog is a great idea and you’ve got a good system there. The sad fact is that we all have only so many hours in a day and if we spend so many of them in blogosphere, we won’t have any ideas , or energy to blog about, or with. I too have unfollowed a few people just recently. Unfortunately, we have to be ruthless. It works both ways…I get followed and unfollowed all the time. I suspect it’s because sometimes if I don’t give instant responses they clear off. I respond as fast as I can. Yes, I’m quite pleased with myself at losing 2 lbs just by carrying out what I wrote in this post. It’s not a huge loss, considering I hear of people shedding a lot more in a week on some of the popular diets, but I certainly feel a lot better for it. Although the clean up of my blog took a good three days to complete, it has given me much more time to get on with reading the blogs of the bloggers who support me, writing, and reading and reviewing books. Add to the fact that I am also now getting away from the computer more often, taking breaks, and going out walking, I feel a heck of a lot more better for it all. My sleeping pattern has changed and instead of waking up at least four or five times in the night, some nights I now sleep right the way through. I know we all lead busy lives, but communicating with your followers and readers is so important. It should not matter at all that it may take days to respond to a comment, the important bit is that you do respond. If people expect instant replies or relies within 24 hours then I think they have far too much spare time on their hands and should maybe take up another hobby where an instant response is not the key. Just by now reading posts via Bloglovin, or when I get my daily email reminder from WordPress, will mean that I won’t be reading blog posts the instant they are published. It won’t be until the next day or the day after that that I’ll get to read them. If the author has a problem with that (and I don’t think any would) then my finger will be pressing that unfollow button. I need to do exactly the same thing Hugh, I feel completely overwhelmed at the moment, as I’ve just transferred to WP.org and trying to get it up and running. It’s a funny thing how we feel guilty if we don’t like or comment to the people we follow. The community is extremely important to me, but like you I’ve noticed that many just blog for themselves, almost a kind of therapy, and they don’t enter into chit chat. This is fine of course and each to their own. Saying that, my family and friends are currently taking a back seat to my blog, and that cannot be a good thing! Hi Amanda, you sound like you have your hands full already with the transfer to WP.Org. Is there any reason why you are transferring over to that site? I’d love to know. Yes, that guilty feeling is strange isn’t it, when you think you may have missed a blog post from a blog you follow, especially the ones you regally read. I have heard of authors getting upset if somebody who always comments on their posts misses one. It’s the classic ‘toys out of pram’ situation often ending up with the person who failed to read and comment felling very guilty. I almost certainly would just walk away and unfollow if anybody did that to me. I hope the spring/winter clean up of your blog goes well, and that it adds a lot of benefits to you blogging. It has certainly helped me and had to be done. I aim to give it a year or so and see what happens, if it doesn’t work out, I will switch back to .com – keep it free and blog just for fun. I’m still working on my theme, it’s crazy how complicated it all is. I never knew how much we were molly coddled with .com! Thanks for letting me know, Amanda. Well the very best of luck with it all and I guess we’ll see the progress over on your blog? I’ll have to go and take a look at WP.Org. Thanks Hugh, you won’t see any changes for a while, i have set my blog to a basic WP blog theme, whilst I practice setting up my premium theme on a private site. I will be a while – it is so complicated! Nothing like what we’re used to at all. Hi Colleen, believe me that when you do make that cull you will feel a lot better for it. I was getting so stressed out if I was missing reading blog posts from my reader list that I knew I had to take action – hence the diet and the cull. It has certainly worked for me and I feel far better now that I have a lot more time on my hands to read and comment on those blog that also give me their support. It won’t stop me following blogs who follow me but, come six months, if I’ve not seen them again, then the axe will fall and I will unfollow. Bloglovin’ is such a great platform, especially as you get just the one email from them that contains all the posts and links to the blogs posted the previous day. Good luck with it and let me know if it does work out for you. Alas, I could probably do with following your diet but you’s have to let me borrow Toby as none of the fish seem to appreciate a walk and I’m easily bored just walking from one end of the tank to another. David, you are most welcome to walk Toby, He’d let you walk him all day if he could, but then that means no time for writing. Glad to see I survived the cut Hugh! This is a wonderful idea because I seem to be missing out on a lot of blogs from people I enjoy following and reading. I’m going to put this on my to do list. Well done on the diet. It’s great to hear you’ve done it on your terms rather than the strict dieting schedules handed out to people every new year. Right I’m off to visit Colleen! Have a lovely week and if you’re not busy, I might have a book for you to review, pretty please! I’m starting to read books for review from tomorrow and I’d be delighted to read and review one of your books. I will warn you though, that it does take me a while to read a book. I’m not a fast reader when it comes to books but it would be an honour to read one of yours. Just let me know when its ready. Thanks Ali. Yes, I gave up getting obsessed about the number of followers my blog had, months ago. I still get the odd comment from someone new (usually who is not following me) that just says “Please Follow my Blog” and I think why? I usually mark those comments as spam. Thank you WG. I to was feeling very guilty if I wasn’t reading every single blog post on my reader list. The changes I have made are already helping and I’m no longer fighting with time. Time is working for me now. Yes, I am still following you having only just met you on here, and here we are already commenting on each other posts. I’m enjoying reading your blog very much and I’d never unfollow anybody who takes the time to like and comment on my posts. It’s only those that seem to disappear into thin air once you follow them (after they have followed you) that have ben culled. Thank you for the tip about my fruit salad photo. I may well use it to enter Jennifer’s colour challenge this week, now that you have mentioned it. I’ll certainly look out for that challenge when she starts it as the weather always interests me. What a great diet, on both counts! Thanks so much for linking to my blog Hugh (and I do hope I am still on your list, ha!) but you are so right, I have had to do a similar thing as I just can’t keep up and it is seriously curtailing my off-blog writing. I have also been concerned about the amount of sitting down I do with writing, the one and only thing about writing I don’t like, and try to get in a good walk each day. It is vital actually, as if I sit all day typing I can’t sleep well. You are very welcome, Sherri. It inspired me to write the post. I’ve loved blogging ever since I started my blog 11 months ago, but it does kinda take over your life. I couldn’t believe that I was spending days just reading posts and not getting any writing done, so something had to give and that’s where the diet idea also came from. I agree as well that we need to get away from the computer screen often and go outside (weather permitting) and take a walk which helps clear the mind and just one week of doing that has really helped me sleep better and gain lots more energy. I think it also works on the mind as well and gets the creative clogs going. I’m so in need of doing the same. And I really do have to go check out BlogLovin to figure out what it’s all about. Bloglovin’ is great Norm, as it covers all Blogging platforms so all your favourite blogs in one place rather than having go visit each blogging platform separately. When you visit it, look for me on there and I’ll then follow you back. It’s very easy to set up as well. Took me minutes to put my blog on there. Hi Hugh, I’m having lunch now, a cheese sandwich! I saw your fruit salad, please send me this salad, I need to lose some weight as well, but I’m too lazy to cut and wash all the fruits early in the morning, so I always bring a sandwich. Two pounds per week is like magic, keep going! . I wish you didn’t lose my blog in your blog diet, I love your comments, and your dog is so cute. Hi Elizabeth, well I can get you the recipe for the salad. It was a huge hit with the family over Christmas. Most of it was made up of pre packed cut up fruit but there was cutting and washing to do as well, but only a small amount. Wow, six hundred posts is a huge amount, Suzie, you must have been writing more than five a day? I’ll certainly get around to deleting some of my older posts soon, but I’ve only got 140 so far, so maybe when I hit 200 posts I’ll take a look and slim the blog down a little. That’s great advice, thank you very much. Sometimes it is was 2 or 3 a day, but over 2 years it has built up! I was never any good with my maths. Susie. You obviously had, and still have, a real passion for writing if writing two or three posts a day. It’s amazing just how quickly they do build up. I’d never of thought that I would have written 140 blog posts in 11 months when I first created my WordPress account. It’s quite addictive isn’t it! You are prescient, Hugh. I was off to my reader for a look see and a cull. It is satisfying. It sure is, Geoff. After I finished the cull yesterday, I had one of the best night sleeps for a long time. Happy culling. My blog needs your diet. I’ve been reading posts on my phone for the last 40 mins.! Go ahead, I can highly recommend it and once you have done it, you’ll feel great. I was spending whole days doing nothing but reading and commenting on blogs, most of which never paid me a visit for the reasons I highlighted in my post. Now they are gone, I have more time to read and write. That is good advice Hugh. When I get to 50 follows I always start a cull for exactly the reasons that you have set out. I am sure that you won’t become a 2 year statistic! One tip from me – become a recycler. New followers rarely go back over old posts so find a way of reissuing them to introduce new followers to previous bits of work. I use the weekly photo challenge to do this. Thanks, Andrew. I’m glad to hear I’m not the only ‘culler’ around here. It had to be done and I do feel far better for doing it. It’s something I should have done a while ago. I’m a huge fan of reposting old posts. In fact it’s a subject on my list to write a post about.